Still have problems? Contact us! ... is straight forward. Download the installer, run it, and you are done. Don't be afraid: There is only one download and only one setup to run. We attach great importance to make our products as intuitive to use and platform complaint as possible. However you need help? Please be aware that we continuously extend and bugfix our software. So when you are still facing problems although you have the latest updates installed, please read along our troubleshooting step-by-step guidance. In any other case feel free to contact us! 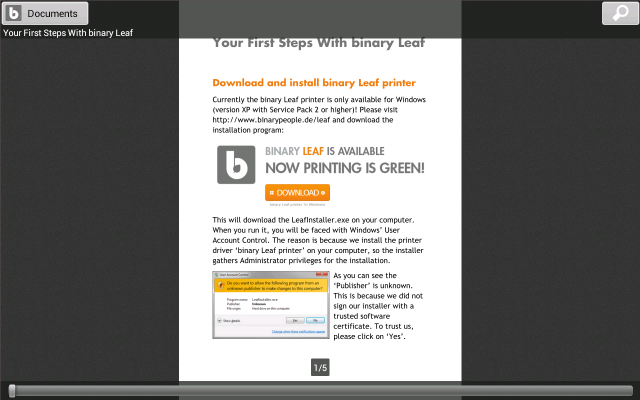 When you installed the binary Leaf App on your tablet or handset device, you also need to install the binary Leaf printer on your Windows computer. 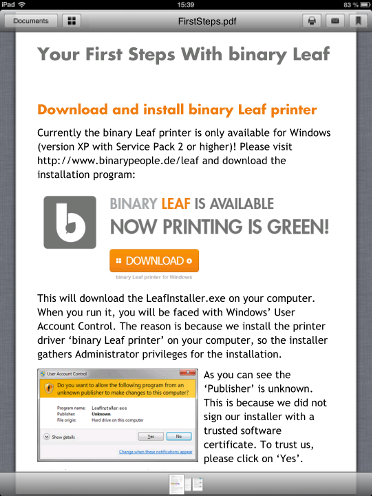 Currently the binary Leaf printer is only available for Windows XP (with Service Pack 2) or higher! We plan a version for Mac OS X in the near future! 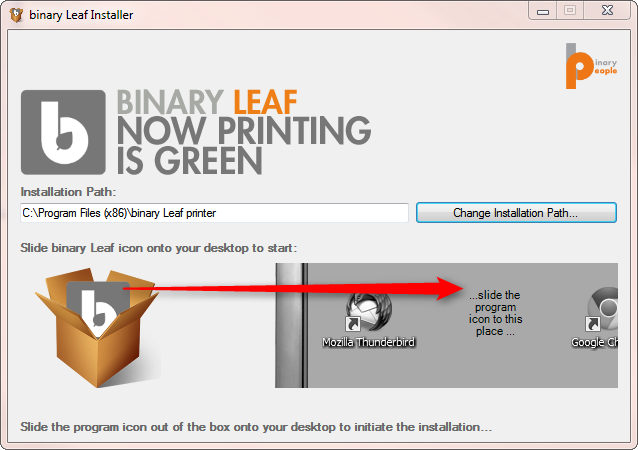 The reason is because we install the printer driver ‘binary Leaf printer’ on your computer, so the installer gathers Administrator privileges for the installation. As you can see the Publisher is unknown. 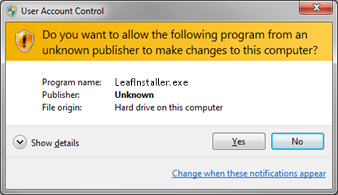 This is because we did not sign our installer with a trusted software certificate. To trust us, please click on 'Yes'. All three software packages will be install in one go. When installed you have done all necessary steps to prepare your Windows computer. 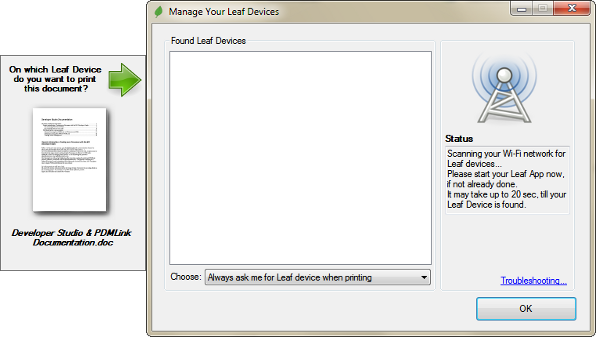 We added the ‘binary Leaf printer’ to your printers. and your printout will appear on your mobile device! 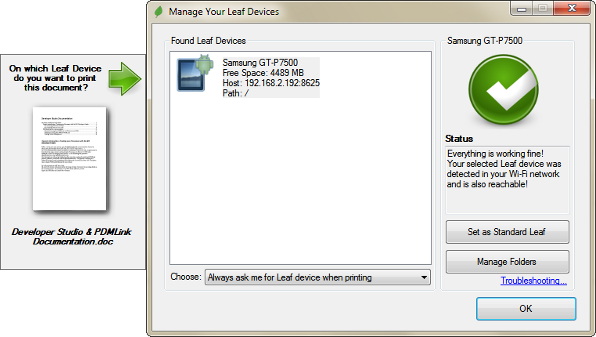 When you initiated a print, this additional tool will show up to give to the opportunity to select and/or manage your mobile device (by setting the standard destination folder for your printouts for example). 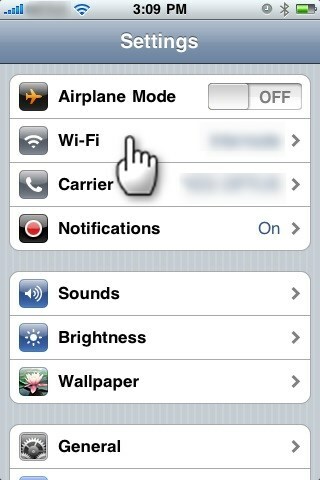 You set the selected device to be your standard device if you like by clicking the button. This makes sense if you have only one device in use. 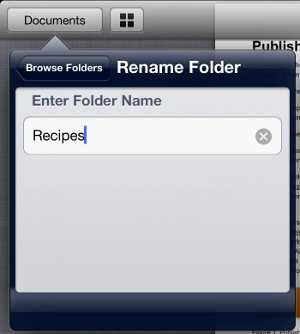 You easily add, rename or delete folders. Please be aware that a folder has to be empty before you can delete it. 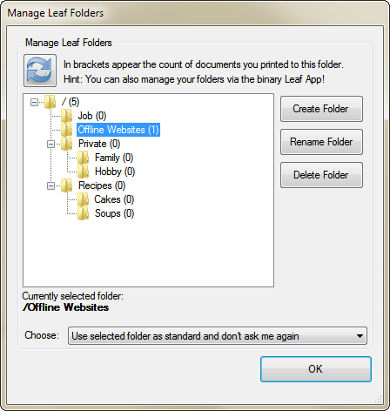 Delete or move all documents from the folder using the binary Leaf App. After the first start the App will also show you the 'First Steps' that contain nearly the same information this paragraph does. 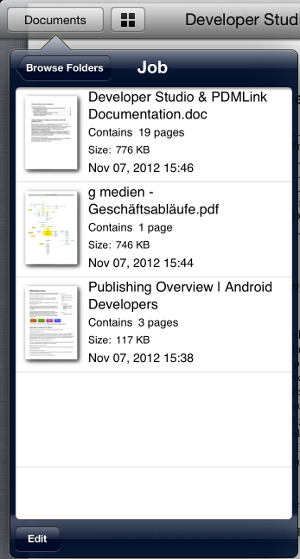 In the first appearing panel you see your structured folders. Each folder item has a label with the count of the containing print-outs on its very right. 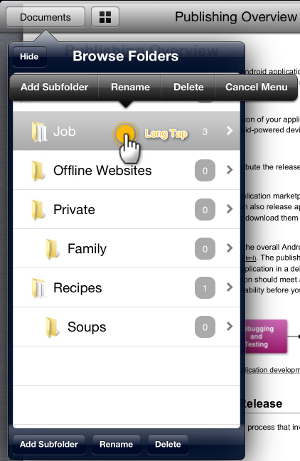 With a long tap on a folder you can open up the context menu that offers you the actions you can perform on this folder. Please be aware that you can only delete an empty folder. So first remove all print-outs before deleting it. 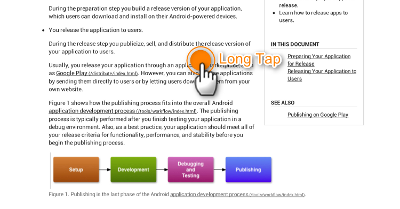 When completed, tap on to quite the edit mode. Please note that only empty folders can be removed! 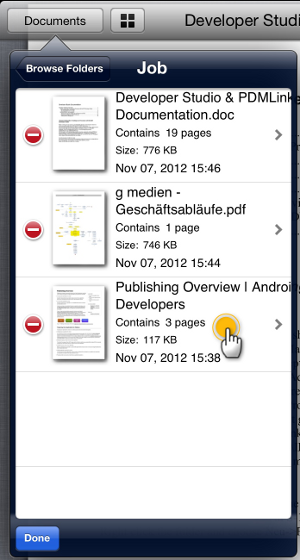 When you tap on a folder item the Document Browser will show your containing print-outs. Tap on an item to open the according print-out. 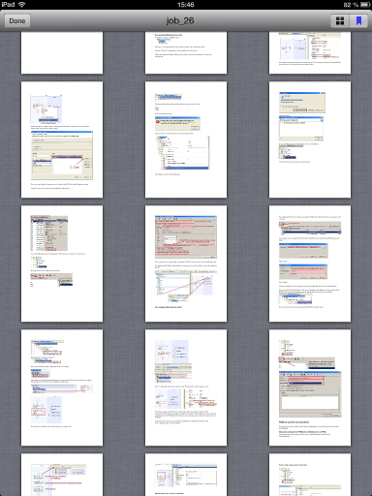 On the left you always find the thumbnail of the first page, then some information about the document itself. 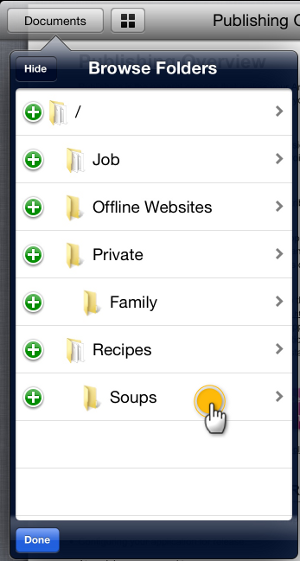 By tapping on the button you get back to the folder overview again. Below at bottom of the Document Browser you find the button. Pressing it sets the list view in the edit mode. 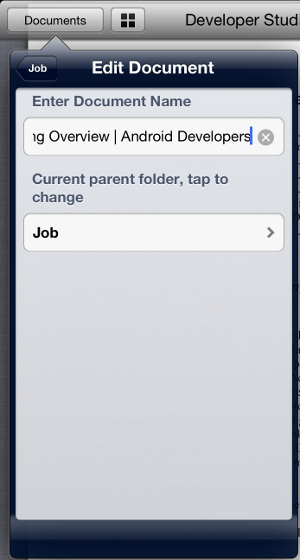 For example, tapping the ‘Private’ folder, will move the document to this folder. 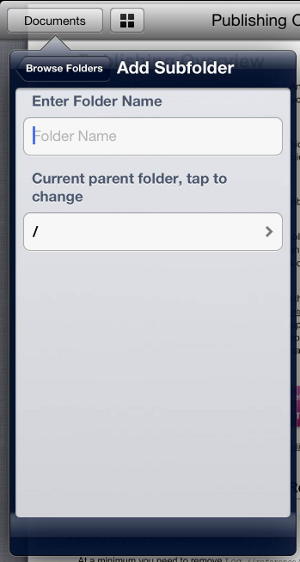 Again, you can reach the context menu by long-tapping on a print-out item with all available operations. Please be aware that you can only delete an empty folder. Remove all print-outs first (see below) before deleting it. 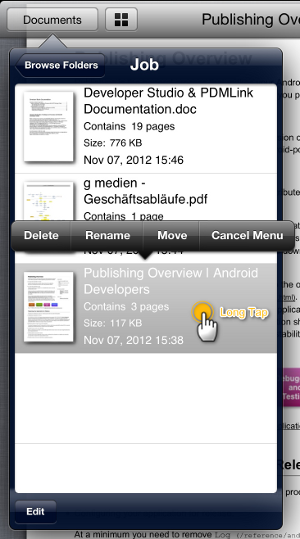 When you tap on a folder, the containing printed documents will appear. On the left you have a thumbnail of the first page. Then some information about the document itself. 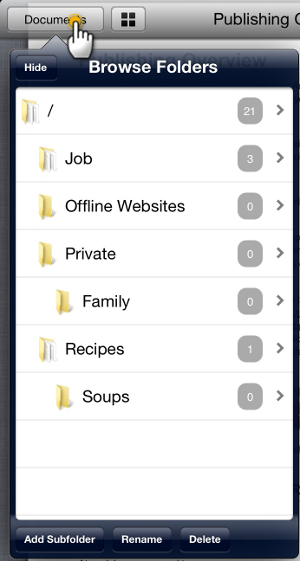 On top of the list there is the that brings you back to the folder view. 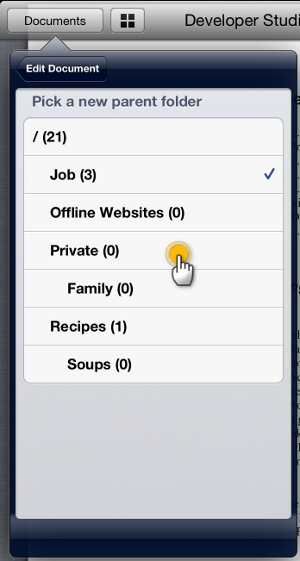 The context menu provides all necessary operations. 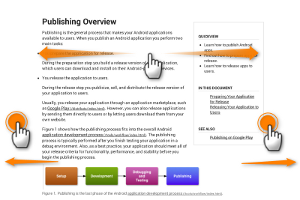 For example you can open the document in Adobe Reader and make some notes there. 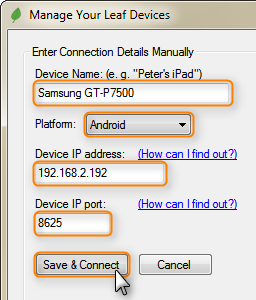 Check your device is connected to same Wi-Fi network your Windows desktop computer is. Be sure that you have the latest versions installed. Restart the App on your device. Restart the Bonjour system service. 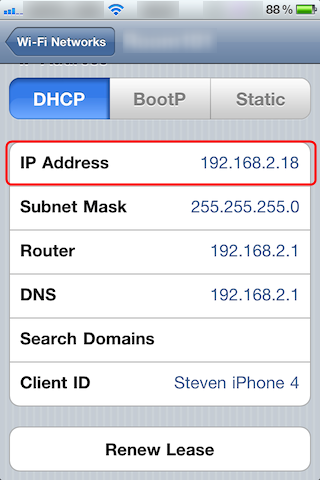 Enter the connection details manually (see below). 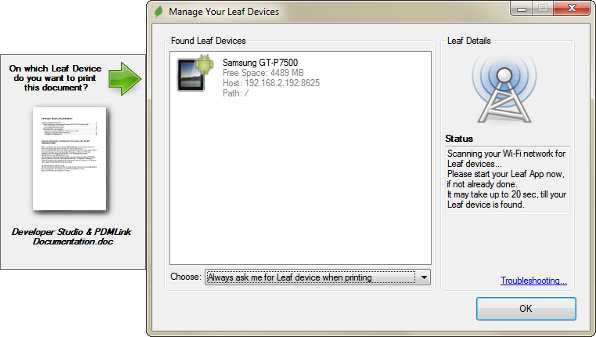 Now open the binary Leaf settings that brings up a window named 'Manage Your Leaf Devices'. 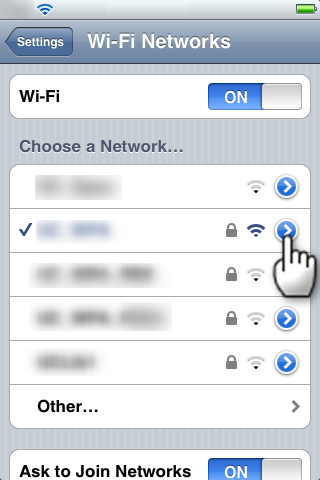 Then press the 'Save & Connect' button to check if your device is reachable over the Wi-Fi network. 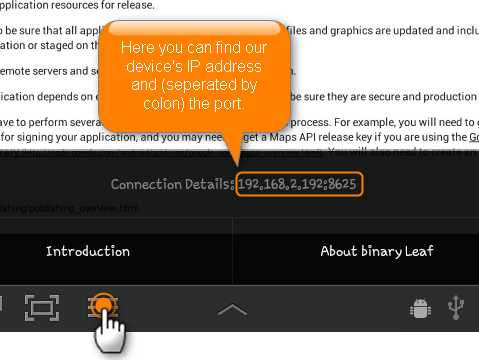 If not, please ensure you did not made a typo in your manual configuration, and check the IP address of your device again. 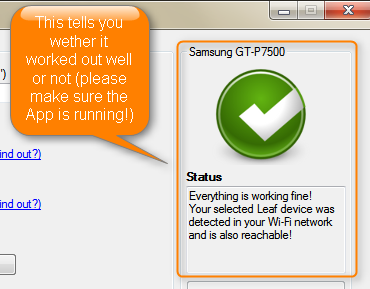 Also check if your App is currently running on your device. Last option is to drop us a note with a detailed problem description. We will try to help you. Thanks!